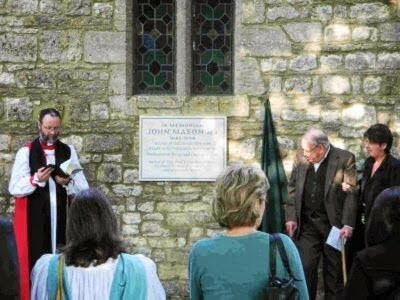 John Mason, Water Stratford’s most famous rector, was a dedicated pastor and an important early hymn-writer, but the sensational events surrounding the end of his life have tended to obscure his earlier achievements. He was buried in our church or churchyard on 22nd May 1694 but there is no indication of where. However, a generous gift by a local man who had found Mason's words helpful in his life enabled us to commission the celebrated letter carver Alec Peever to produce a commemorative tablet which rectified this lack of a memorial to our notable priest. This was dedicated by the Bishop of Buckingham, The Rt Revd Alan Wilson, on the outside of the church tower on 7th June 2008. About seventy people attended the Commemoration Service, in which they sang three of Mason's hymns and listened to historical information about Mason's life and work and an interesting sermon from Bishop Alan. this major event in our church's history.